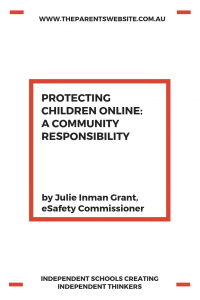 Parents are at the frontline of keeping children safe online, but all of us have a role in protecting children from harm, writes eSafety Commissioner Julie Inman Grant. Many of us grew up in a very different world to the one in which today’s children are developing. The next generation of kids are wired differently, because they’re growing up wired. They live in a world that is all pervasive and very intensive. They have different conceptions about privacy and sharing; they are, at least initially, not able to fully comprehend the potential long-term implications of their online actions. They have ready access to vast amounts of online content, some of it graphic and disturbing. 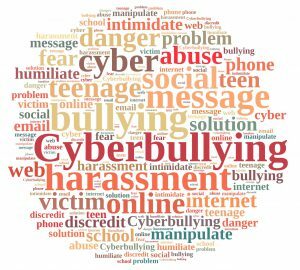 While they may exhibit technological mastery, they have not yet developed the maturity, experience and resilience to cope with the potential online onslaught – whether it be cyberbullying, online grooming or image-based abuse. Today’s teens also feel pressured to curate the ‘rock star’ versions of themselves online, measuring their popularity and self-worth in accordance with their ‘likes’. They face intensifying peer pressure to compromise their own privacy and safety by sharing passwords or even intimate images. This is leading to a range of concerning trends we’re seeing directed at Australian children, including sextortion, impersonation and fake accounts designed to humiliate and destabilise young people in their peer groups, and more complex forms of social engineering, including coerced, self-produced child sexual abuse content. Unfortunately it is not a matter of ‘if’ but ‘when’ a child is going to have a negative experience online. Our Youth and Digital Dangers survey results of 3000 Australian kids validated this view – one in four Australian kids had been contacted by a stranger as the most common negative experience online – followed by social exclusion, or having mean things said about them online. There is no doubt that online safety issues have become a huge parental challenge for time-poor adults who are often juggling the pressures of work with the increasing demands of child rearing. Parents and care givers need to be the frontline of defence in terms of protecting children from online dangers – which means really engaging in their online lives the way they do in their children’s everyday lives. There is no substitute for early, active and ongoing engagement in our children’s online lives, teaching them the rights and responsibilities of internet use, setting boundaries but also letting our children know that they can come to us when they encounter anything confronting online. However, the role of keeping children safe online is not solely the responsibility of parents. National Child Protection Week is an important opportunity to stop and reflect on the role that all of us play in our communities – online and offline – to protect children from harm. At the eSafety Office, we believe that by building stronger communities, we can create safer environments for children. One way we do this is through the work of our Cyberreport team, which receives reports about offensive and illegal online content and takes action to have offending content removed from the internet. The team prioritises investigations concerning child sexual abuse material, referring such content through our international partners for rapid take-down. It is important to remember behind each image is a child being sexually abused. By trading and profiting from the posting of these images online, the abuse is being memorialised, re-victimising the child. The work our team does through intelligence gathering and referral helps law enforcement identify and rescue the children and track down the predator. But the taking down of content is critical to the victim’s dignity and starves the offenders of the opportunity to further profit from this heinous abuse. Online child exploitation is a global scourge and the Cyberreport team would not be able to make a meaningful impact operating in a ‘silo’. As such, the team proactively seeks out opportunities to leverage its analytical capability and provide valuable intelligence to our law enforcement colleagues, supporting their incredibly important work in protecting children – both here in Australia and overseas. We will see greater outcomes for the protection of Australian children across the board if we frame our solutions and initiatives through networks and mobilise the wider community. Ultimately, online safety can best be described as a journey, not a destination. Long term, sustained social and cultural change is the goal we must strive for to truly make the internet a safer place for children. This will require the coordinated efforts of the whole community – locally and globally – as we embrace the notion that protecting children online is everyone’s business. This blog is adapted from a speech by Julie Inman Grant given at the Youth, Technology and Virtual Communities Conference 2018. We thank the Office of the eSafety Commissioner for allowing us to republish the blog. You can read the original here.